What better to serve on a warm summer's evening than one of the most traditional and best-loved of all English desserts. A pack of Bird's Strawberry Trifle makes it so easy. 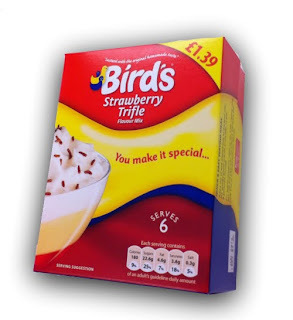 All you need is some milk, a little sugar and the contents of this pack and you've got six scrumptious servings of real English trifle. Prep takes only a few minutes and the dessert is ready to eat in a couple of hours in the fridge (time for the jelly to set). Add some fresh berries (strawberries, raspberries, blackberries or blueberries) to the jelly to give the flavour a big fruity boost and stretch the trifle to 8 servings.